ads at the bottom of this page. 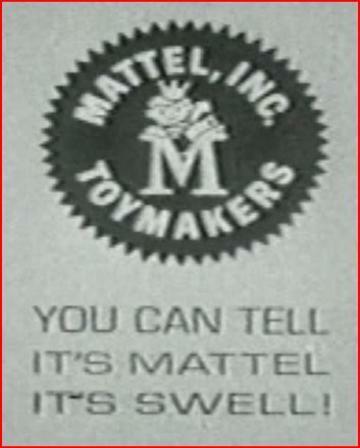 It's swell" is Mattel's motto. patent on the doll in Feb of 1960.
name). He designed the doll head to look like his little girl. June Foray did the voice for Chatty Cathy in 1960. Switzerland as headquarters for the companyâ€™s worldwide marketing. but she is Mattel made. There also could be more foreign speaking Chatty Cathy dolls. I am still researching. Cathy in Toronto Canada. 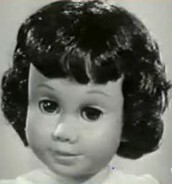 The Chatty Cathy doll was such a hit that Mattel bought out Dee & Cee in 1962.
buying a better quality of material not only for the dolls but also in the type of clothes the doll was dressed in. and the American dolls do not look alike. The difference is in the head and limbs. The bodies are the same. different, Canadian hair is more coarse. had their own line of clothes for the Chatty Cathy doll by 1962. You can see them in the ads on my clothes page. red dress and including the different colors. 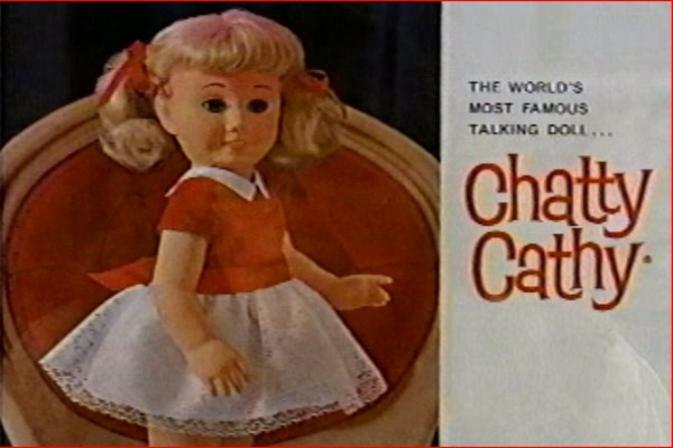 used as the official voice of the Chatty Cathy doll. blondes they did come with prototype bodies. Cathy doll they also decide to retire that dress. the phrases just a bit different and a new box was made. The box now was dated 1961 and was a window box. BLON saying the first set. Both records were used in both blonde and brunette dolls in America and Canada. box marked by Dee & Cee. it on a Canadian doll. 90-day warranty that was given for the original Chatty Cathy doll. brunette to say different phrase from one another. It's pretty easy to figure out why Mattel made the different bodies. better record was made that did not scratch so easy and she now said 18 phrases instead of the original 11.
have never found a MCMLX record marked BLON or BRUN and all of the MCMLX records say the first set of phrases. still in use in 1961.
both records in the 3 different colored haired dolls. first happen with body #3.
too from brown to white, to nice and pink. doll, because the doll was doing so well in Canada. So my time line is as follows and please remember this is my educated guess. dolls. Those first record sayings are on the front of the first 1959 boxes. they had records for or vice versa depending on where the doll was made. different heads were used on these two bodies #4 and #5. Soft head pigtails blonde, brunette, redheads with blue and brown and glassine eyes. Hard head pigtails blonde, brunette and redheads with blue brown and glassine eyes. any doll that doesn't fit the description below doesn't belong or some think is a very rare doll. 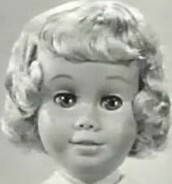 An American soft head blonde bob prototype with blue eyes and brown limbs. An American soft head brunette bob with brown eyes on a #1 body with brown limbs. An American hard head blonde or brunette Paige Boy with blue eyes on a #3 body with white limbs and open right hand. An American soft head blonde, brunette or redhead pigtail with blue eyes on a #4 body with yellow limbs. An American hard head blonde, brunette or redhead pigtail with blue eyes on a #5 body with peach colored limbs. and came in different boxes. A prototype always came as a soft head bob and has brown limbs. #0-#3 always say 11 phrases and never came in box #3. #5 always says 18 phrase and came in box #3. Canadian dolls always have soft heads and if they have pigtails also have 2 bald spots on the back of their heads. And that's it, there are no other rules with these dolls that you can go by and be completely confident she came that way. 9) Je veux mon lait (I want my milk). in the Prototype and early dolls. be found in the Prototype dolls. 1) Te quiero mucho. I love you very much. 2) Vamos a campo. Lets go to the country. 3) Dame un beso. Give me a kiss. 4) Juega conmigo. Play with me. 5) Cuntame un cuento. Tell me a story. 6) Estoy cansada. I'm tired. 7) Hola. Qu tal? Hello. How are you? 8) Tengo sueo. I'm sleepy. 9) Eso me gusta. I like that. help with the translation of 2 recordings of this doll.